We are offering quality assured Jewellery Machine. Available in various configurations, the offered machine is highly acclaimed in the market. We are high on demand in the market for offering a unique collection of High Speed Die Cutting Press Machine for jewelry making. Offered machine is specially designed for gold and silver industries for making jewellery items. 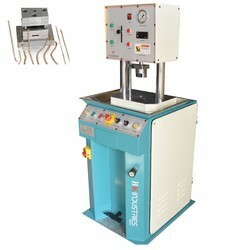 This machine is available from us on numerous specifications so as to meet the variegated demand of clientele. Our given machine is known for their operational accuracy, low power consumption.